Walgreens, our country’s biggest pharmacy chain, was considering whether to try to dodge paying its fair share of taxes. It was thinking about shifting its corporate address from Illinois to Switzerland, a tax haven country. After we released this report, co-authored by Change to Win Retail Initiatives, and after we began mobilizing people to boycott the company, Walgreens backed off from this plan. Walgreens will still complete its planned merger with Alliance Boots, a Swiss pharmacy chain. Under the tax-dodging plan it abandoned, after the merger Walgreens could have taken advantage of a tax loophole to reincorporate itself offshore. This could have let the company avoid $4 billion in U.S. taxes over the next five years, leaving the rest of us to pick up the tab. Walgreens would still have been controlled from the U.S. It would still have benefited from our roads, bridges and infrastructure, and it would will still have had more than $70 billion in annual U.S. sales. Our report helped to expose Walgreens’ potential tax avoidance scheme and the impact it could have had. 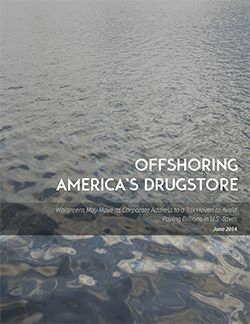 Read the report: Offshoring America’s Drugstore: Walgreens May Move Its Corporate Address to a Tax Haven to Avoid Paying Billions in U.S. Taxes.